Fun for all - ages 12 and up. There's no maximum age for adventure! 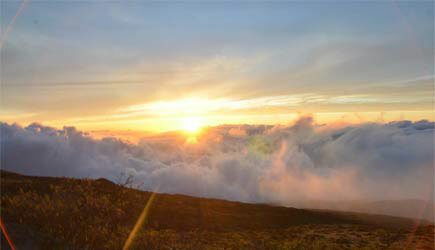 On the Sunrise Bike and Zip tour, witness the day begin from the 10,000 ft summit of Haleakala National Park. The volcanic and subtropical landscape will open up unforgettable views, and introduce you to colors you never knew existed. You will be picked up at your hotel at the start of the tour, and after you watch sunrise you will be driven to the 6500 ft level to begin your bike tour. You will cruise down the 21 switchbacks of the world’s largest resting volcano that lead you to the beginning of the 5-line Haleakala zipline tour. 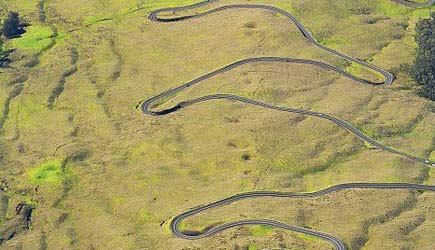 Located on the slopes of Haleakala just outside the national park. You will be taken across an Indiana Jones swinging bridge, over 90 foot drops and canyons, Maui’s only pendulum line, and through a forest of eucalyptus trees. All of their carefully engineered equipment is tested to hold at least 5,000 lbs, and each zipline has a minimum breaking strength of over 26,000 lbs. The guides go through meticulous training, and they inspect daily all ziplines, platforms, trails, and equipment on each of our courses. They will make each tour a unique Hawaiian experience by sharing the rich history of the island. Experience the adventure and beauty of untouched Hawaiian nature! Schedule: Monday, Tuesday and Wednesday between 3:15 – 3:45am. Check In: Complimentary transportation depending on the location of your accommodations. Your transportation options and times will be confirmed at time of booking. Cancellation / Weather Policy: All tours go out rain or shine; a minimum of 48 hours notice is required for cancellations or changes. Included on Tour: Transportation, hot beverages and snacks. What to Bring & Wear: Hiking boots or athletic shoes are required (no Tevas, Keens, Crocs, etc). Shorts and a short-sleeved shirt are recommended, and a light jacket in case it gets chilly at 4,200 foot elevation. White clothing is NOT recommended. You can bring your backpack along, and they will lock it up for you while you zip. Bring your sunscreen, and they also recommend wearing clothing that helps block the sun. Glasses and sunglasses may be worn with a strap. Bring a camera at your own risk, and they recommend you securely strap it to yourself. Restrictions: Minimum age for this tour is 12; anyone under 18 must have a legal guardian present at check in. All participants must sign a waiver of liability prior to taking this tour. Minimum weight is 60 pounds and maximum weight is 250 pounds. No one who is pregnant may participate and anyone with a history of neck, back, or joint injuries or chronic heart problems should use their own discretion or check with their doctor about their capabilities to safely participate in this tour. Guests who are zip lining must be in good enough health to hike hike a 1/2 mile at elevation and over uneven surfaces. They recommend you have some recreational bike experience. No smoking on this tour. No scuba diving within 24 hours of the start of this tour. Pride of America cruise ship passengers are able to do this tour on Monday morning, and they will pick you up at the dock. Lahaina cruise ship passengers will likely pick a zipline course that is closer to the ship … see our Kaanapali Zipline or Flyin’ Hawaiian Zipline. This combo tour option is great for people who are a little short on time and want to squeeze a lot into a single day. There are three completely different tour experiences here … the sunrise viewing from the 10,000 foot summit of Haleakala, downhill biking from just outside the park entrance through the series of switchbacks located above the treeline, and finally the zipline course at Skyline Haleakala. You can cross three activities off your list with this single event, giving you more free time to explore or enjoy the beach! Due to the huge popularity of sunrise viewing from the top of the “crater”, Haleakala National Park is in the middle of some massive changes to limit the number of tour companies and the number of rental cars inside the park during the pre-dawn hours. In order to drive a rental car to the summit for this expeience, you MUST obtain a permit weeks in advance. This tour avoids the hassle of having to arrange the permit, and also saves you the white-knuckle-in-the-dark drive in the middle of the night. They’ll pick you up at your resort and you can catch a few zzz’s on the way up the hill. The biking portion of this tour is shorter than some of the other bike tours that we book, but it DOES include the best part of the mountain … the series of switchbacks located between 6700 feet and 4000 feet of elevation. The county of Maui is discouraging bike tours that pass through residential and high-traffic areas on the lower part of the mountain, and the biking that is available on this tour may soon be the only portion of the mountain that is available for downhill bike riding (with the added security of a guide and a support vehicle). There is a very modest amount of hiking on the zipline portion of this tour, and the tour operator says you’ve got to be able to walk for a half a mile. You don’t have to be a buffed athelete to do this tour, but you should be in reasonable physical condition and in overall good health. Oh, no upper arm and body strength is required. The harness and lanyard carry all your weight and you are securely clipped in. You wouldn’t fall if you let go.